Cupid’s Span and San Francisco Oakland Bay Bridge, originally uploaded by dmzajac2004-. 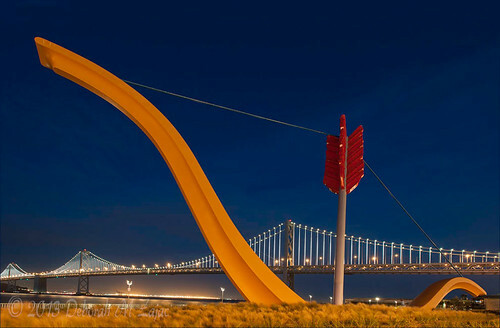 Cupid’s Span with the Bay Bridge adorned with the new lights in the background. "Situated on the crest of Rincon Park’s northern knoll, Cupid’s Span is a depiction of a bow and arrow. Composed of fiberglass and steel, the sculpture stands approximately 60 feet tall and is 130-140 feet wide. The sculpture has an open design to provide a frame for the surrounding landscape. Cupid’s Span adds to Oldenburg and van Bruggen’s long list of famous large-scale civic sculptures, which include "Spoonbridge and Cherry" in Walker Art Center in Minneapolis, "Saw, Sawing" in Tokyo, Japan, and "Needlethread" in Milan.